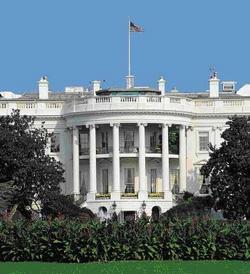 On July 6, 2012, the White House released an Executive Order that addresses National Security and Emergency Preparedness (NS/EP) communications functions of the federal government. Contrary to some concerns raised in a few Amateur Radio circles, the Order does not appear to contain any threat to the Amateur Service or its ability to continue support communications during times of emergency or disaster. It also poses no threat to amateur spectrum. "The purpose of the new entity, which would be created by this Order within the Executive Branch, appears to be to plan for future NS/EP communications and to ensure survivability, hardness and interoperability, as well as to develop a long-term strategic plan for NS/EP communications," said ARRL Regulatory Information Manager Dan Henderson, N1ND. "Based on the Amateur Service's ongoing, positive working relationship with officials at the Department of Homeland Security's Office of Emergency Communications, it is hard to envision that any new management plan would not include Amateur Radio. Nothing in this Order directly affects Amateur Radio's daily operations." A good summary of the content of the Order can be found here. 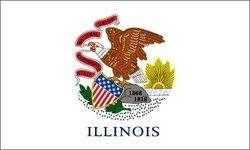 Following in the footsteps of various other states, Illinois Governor Pat Quinn signed HB 1390 -- a state-level PRB-1 law -- on June 30, effective immediately. PRB-1 (as codified in Section 97.15(b)) was released by the FCC in 1985 and states that "[s]tate and local regulation of a station antenna structure must not preclude amateur service communications. Rather, it must reasonably accommodate such communications and must constitute the minimum practicable regulation to accomplish the state or local authority's legitimate purpose." Read more here. NASA will televise the launch and docking of the next mission to the International Space Station (ISS), scheduled for 8:40 PM (CDT) Saturday, July 14 (0140 UTC Sunday, July 15). 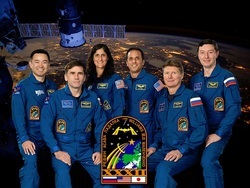 NASA Flight Engineer Sunita Williams, KD5PLB, along with Russian cosmonaut Yuri Malenchenko, RK3DUP, and Japan Aerospace Exploration Agency astronaut Akihiko Hoshide, KE5DNI, are completing preparations as they undergo their final Soyuz spacecraft fit. Live NASA TV coverage of the Soyuz TMA-05M spacecraft launch from the Baikonur Cosmodrome in Kazakhstan begins at 8:30 PM CDT on Saturday, July 14 (0130 UTC July 15). Read more here. The ARRL will host a webinar from 8-9:30 PM EDT Tuesday, July 17 (0000-0130 UTC Wednesday, July 18) to present information about the 2012 hurricane season and the Amateur Radio response. The program will offer presentations from representatives from the National Hurricane Center (NHC) and WX4NHC (the Amateur Radio station at the NHC), the VoIP Hurricane Net, the Hurricane Watch Net and the ARRL. Webinar registration is open to all, but this informative web session will be of particular interest to those amateurs in hurricane-prone areas. If you are interested in emergency communications and hurricane preparedness and response, you are invited to attend this online presentation. Read more here. 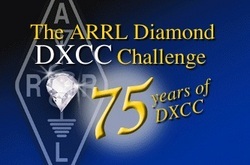 Recently, the ARRL has been able to add some additional tools and reports to the Diamond DXCC system, including an online form that is similar to the Online DXCC application and a listing of operators who qualified for the basic award and how many entities they have credited. Read more here. 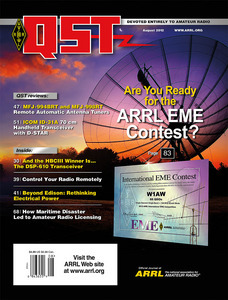 This cover of the August issue of QST spotlights the ARRL International Earth-Moon-Earth (EME) Contest. With the advent of very sensitive receiving preamplifiers and commercially available high-gain Yagi antennas, many VHF operators are enjoying successful weak signal contacts. With a total path length of about 500,000 miles, EME is the ultimate DX! So why not set aside a couple of hours and explore the August issue of QST. Avid kit-builder and homebrewer Jim Veatch, WA2EUJ, is no stranger to the ARRL Hombrew Challenge. As the winner of the First Homebrew Challenge and the Second Homebrew Challenge (advanced category), Veatch once again won the Homebrew Challenge III with his compact competent transceiver that covers 12 meters, as well as 10 and 6 in a professional looking package that offers features well beyond the requirements -- for a total parts cost of $198.30. This remarkable radio is a dual conversion, downconverting superhet design that uses the latest digital signal processing technology from the second IF on. Read about it -- and find out how to build it yourself -- in Veatch's article "The DSP-610 Transceiver." If your rig is set up for sound card modes, you can run your radio from afar. In "Remote Control Made Easy," John Raydo, K0IZ, shows how to set up your station to operate via remote control. Operating this way, Raydo says, can help avoid antenna restrictions, as well as allow hams to operate while traveling and can even minimize local RFI problems. If Murphy has ever visited your antenna tuner, you will definitely want to read "My Tuner Tuned My Antenna -- But Now It Doesn't!" by QST Technical Editor Joel Hallas, W1ZR. Hallas shows ways to get your antenna tuner back to doing what it should -- tuning your antenna each and every time. August 17, 2012 marks the 100th anniversary of the signing of the Radio Act of 1912. It was this piece of legislation that introduced the first rules for Amateur Radio and changed the way we, as radio amateurs, operate. Join ARRL News Editor S. Khrystyne Keane, K1SFA, as she looks at how Congress, in the wake of the RMS Titanic disaster, took swift action to try and tame the chaos of the airwaves. David Palmer, KB5WIA, made an overland trek to activate a rare grid square for satellite ops. In his article "Backpacking with Satellites," Palmer explains how he was able to work hams using AO-57, VO-52, AO-27, FO-29, AO-51 and SO-50 from CM-79, a grid square that has no roads, houses, electricity or trails. ARRL Contributing Editor Phil Salas, AD5X, takes a look at the MFJ-994BRT and MFJ-998RT remote automatic antenna tuners in this month's Product Review. He says these antenna tuners "provide reasonably priced remote auto tuner solutions for stations with high power amplifiers." QST Editor Steve Ford, WB8IMY, checked out the ICOM ID-31A 70 cm handheld transceiver with D-STAR, saying that it "may be the most user-friendly D-STAR transceiver available. It is also a high feature analog FM transceiver, includes a GPS receiver and works with a host of available options -- a very flexible and useful package." Of course, there are the usual columns you know and expect in the August QST: Happenings, Hints & Kinks, The Doctor Is In, Short Takes, How's DX and more. Look for your August issue in your mailbox. QST is the official journal of the ARRL, the national association for Amateur Radio. QST is just one of the many benefits of ARRL membership. To join or renew your ARRL membership, please see the ARRL Web page. 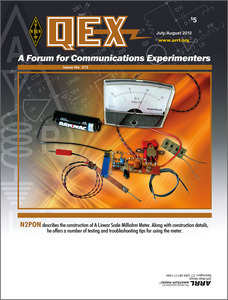 The July/August issue of QEX -- the ARRL's "Forum for Communications Experimenters" -- is coming soon, and it is full of theoretical and practical technical articles that you won't want to miss. Published bimonthly, QEX features technical articles, columns and other items of interest to radio amateurs and communications professionals. The mission of QEX is threefold: To provide a medium for the exchange of ideas and information among Amateur Radio experimenters; to document advanced technical work in the Amateur Radio field, and to support efforts to advance the state of the Amateur Radio art. Read more here. Recent upgrades to the ARRL's Internet system has caused access to both the W1AW EchoLink Conference Server W1AWBDCT and W1AW's IRLP Node 4292 to be temporarily suspended. Access to both W1AW systems can be expected by month's end. We apologize for the inconvenience. The Sun, as seen on Thursday, July 12, 2012 from NASA's SOHO Extreme Ultraviolet Imaging Telescope. This MDI (Michelson Doppler Imager) image was taken in the continuum near the Ni I 6768 Angstrom line. The most prominent features are the sunspots. This is very much how the Sun looks in the visible range of the spectrum. 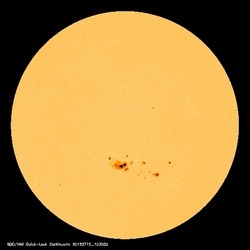 Tad "Don't let the Sun catch you crying" Cook, K7RA, reports: Solar activity rose moderately this week: the average daily sunspot numbers were up nearly 3 points to 120.9, while the average daily solar flux rose more than 28 points to 166.8. There was quite a bit of geomagnetic activity -- the most happening on July 9 -- when the mid-latitude A index reached 29, planetary A index was 30 and Alaska's college A index was 60. The latest prediction shows quiet geomagnetic conditions with the planetary A index at 5 on July 12-26, then 20 on July 27-29, 10 on July 30-31, 15 on August 1-2, 10 on August 3-4, and 8 on August 5. The predicted solar flux is 160 on July 12-13, 155, 145, 140, 130, 120, and 115 on July 14-19, 105 on July 20-21, then rising to 165 on July 28-August 2. Look for more on the ARRL website on Friday, July 13. For more information concerning radio propagation, visit the ARRL Technical Information Service Propagation page. This week's "Tad Cookism" is brought to you by Gerry and the Pacemakers' Don't Let the Sun Catch You Crying. 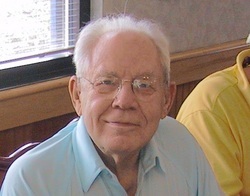 M. Walter Maxwell, W2DU, died July 3 at his home in DeLand, Florida, of natural causes. He was 93. Maxwell was best known in the Amateur Radio realm for his ground-breaking series of articles, "Another Look at Reflections." Published in QST in seven parts from 1973-1976, the series explained in plain English concepts such as line loss, SWR, baluns and antenna tuners. The articles were later compiled into a book, Reflections: Transmission Lines and Antennas, which included additional material on matching networks, antennas and the Smith Chart. It was first published by the ARRL in 1990 and went through several editions. Later editions were published by CQ Communications. Read more here. ARRL DXCC Manager Bill Moore, NC1L, reports that two operations -- the 9X0PY (Rwanda) operation (December 24, 2011-January 7, 2012) and the S21YD (Bangladesh) operation (1994, 1995, 1998 and 1999) -- have been approved for DXCC credit. "If you have had these operations rejected in a recent application, please send an e-mail to the ARRL DXCC Desk," Moore said. "When responding, please include the reference number on your credit slip (found in the upper right hand portion) to help expedite retrieval. Please note that due to heavy e-mail volume, you may not receive a reply. Once updated, results will appear in Logbook of The World (LoTW) accounts, as well as online in the daily listings."